She who didn’t live out loud. Given the state of the world I came into, my baby self vowed to assuage the griefs of both the family and the world by being very, very good. Hair & clothes just right. The perfect Big Sister managing the chaos of a large family. Planning events. Rushing about to make things beautiful, so that the potential for painful reactions were minimized. Vibes watcher. With a tree, always a tree by my side. In the process I also took on the emotional pains of everyone in sight. Without conscious thought I somehow absorbed feelings of others, tucking them in safe places throughout my body. Later, without realizing why, I tried to distance myself. Going away to school. Moving to the Midwest and finally all the way across the country to Oregon. But somehow even at a distance the practice of being a cauldron for others’ feelings held. I ate to cover this up – assuage the feelings – until the food itself began to make me sick. It wasn’t until the feelings became slowly recognizable through massage and healing work that I began to see them for what they were: bargains of my baby self to keep things happy for Mom and Dad. Bargains to keep the peace – the fragile peace amidst….what?? 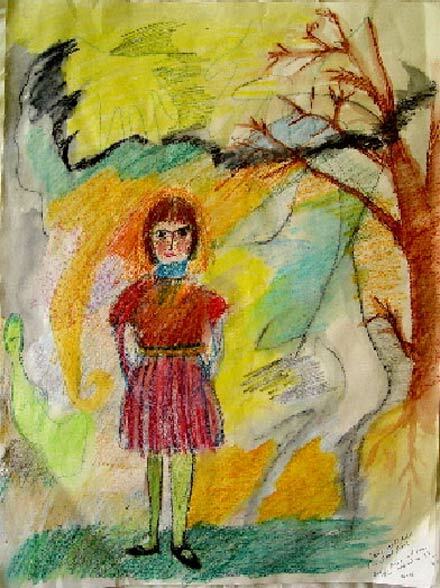 Journal 9/18/96: Dana Zia said to get in touch with the child in me and I saw such a good little girl standing there. I cried and cried over her and also for her as a little baby being wept over by her Mom who was missing her Mom who died 4 days after I was born. And once again – as with other healers and the painting class – I delved into the issue of my vow to take care of my Mother. Last night thinking about all this, I had a new hit on it. It’s always bothered me that I’ve come to take on a rather “poor me – I had to take on my Mom” martyred attitude. The tears and sadness were real but they were the tears of that little girl – not my tears. Plus I always get stopped thinking about what to do with it all in the now. Stop taking care of Mom? Drop my relationship? Be cruel or distant somehow? I suddenly realized that the vow was a baby vow. I thought I would be taking care of her if I were very good. Important note to self: It is the being good part I need to shed! “Being good” meant not speaking my needs, taking care of others, following all the rules – spoken or unspoken, so that I wouldn’t bother Mother or rock her boat (or others she didn’t want rocked, especially my dad). The taking care of others is in my astrological chart – Double Cancer! – and my nature according to several readings. I don’t think I’ll be able to get rid of that. And don’t really want to. But I can let others take care of and give to me. I can speak out about what I want. I can disobey Mother’s rules about Spirit – which I have been for some time….And I can rock Mother’s boat. She doesn’t have to take care of me anymore and I don’t have to guard her from upset – though I can take care of her in other ways.